Building on my last article about technology and interpreters, I would like to take you on a tour of the remote simultaneous interpreting movement that is disturbing the U.S. interpreting industry. The opinions are very divided on the subject of whether this is a good or bad disruption (see links below). I will leave that judgement up to you and simply give you some of the positives and negatives from the perspective of those who have done it. So, let’s jump right in. How is this different from previous types of distance interpreting? Many of you will be familiar with the infamous phone conference interpreting configuration where the interpreter, in the room with one group of participants, speaks into a microphone that is connected to a separate conference call line. Participants who need interpretation will phone into that line and listen to the interpreter. There are more sophisticated versions of this involving a transmitter broadcasting the interpreter’s line to receivers worn by multiple participants in the far location. But for the most part, under this configuration, the interpreter had to be in the same room with at least one group of participants. There are several drawbacks to this method. First, the sound quality. 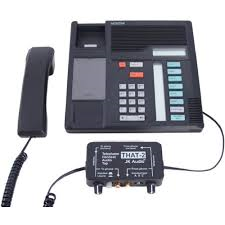 If you are connecting to a phone conference through a landline, the audio quality is often lacking. This impacts both the interpreter’s ability to listen and the client’s ability to hear the interpreter. Even through internet-based platforms like Webex or Skype, the sound quality is often less than ideal. Another downside is that only interpreters in the same room can work together. In other words, you do not have the ability to work with a colleague in another part of the world on the same conference. More on that later. Lastly, this set up is not conducive to large conferences with multiple languages represented. As many of you know, a type of remote video interpreting has long been used the medical and legal community. Video interpreting became a necessity due to the size of the US and relative lack of interpreters, particularly for more rare languages. However, this is almost exclusively performed consecutively from a call center with the necessary infrastructure and teams of technicians to support it. These platforms were little more than a skype call, not requiring the exclusive audio feed for simultaneous. They did not allow multiple interpreters to work together or allow multiple languages in the same meeting. The type of remote simultaneous interpreting that is now available now for international conference is quite different. 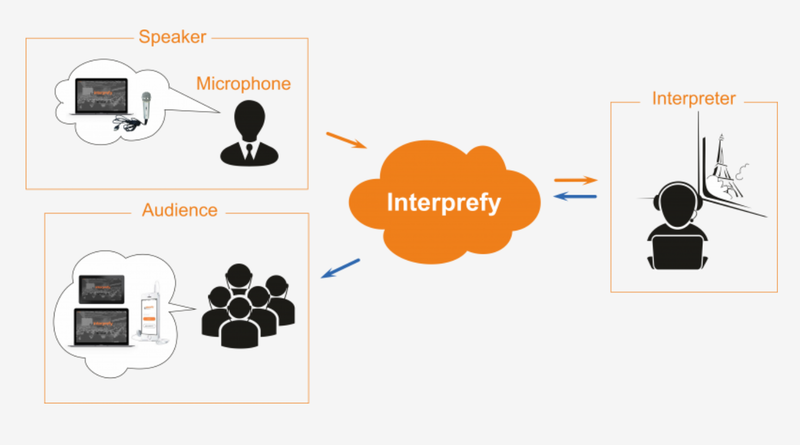 How does a remote interpreting platform work? Another form of remote interpreting involves the interpreters being remote from the conference venue, but not necessarily in their homes. 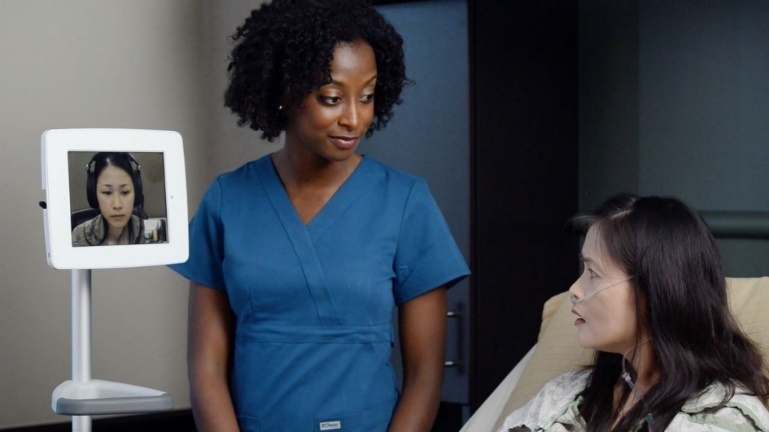 Kudo and Interprefy have booths in major cities for you to use. Their booths are ISO standard and come with a computer for console controls and video feed. Depending on the setup at the conference venue, sometimes you are able to switch cameras as well. If working with a partner in the same booth, the partner would have a similar set up on their table. Then, there is a shared projection screen where you can see what is being projected in the conference venue (powerpoint, videos, etc.) Technicians are on-site in this remote booth to assist with any technical difficulties. If you can’t find a partner in the same city, you can still work with a partner in an affiliated booth in a different part of the world. This assures that both interpreters are in ISO level booths with technicians on-hand, even if they are not physically together. In this case, interpreters would communicate with each other through a chat box on their console computer. What do interpreters like about working remote? Just what you might expect: Working from home in my pajamas, haha. I’m just joking. If we wanted to do that, we would be translators. In all seriousness, there is a benefit to eliminating travel time. No more jet lag or days of half pay. The time you save by not travelling, can be spent on more fruitful endeavors, even scheduling back to back conferences, if you are brave. Second, remote interpreting gives you access to other markets that may have been closed off before. Living in the middle of nowhere as I do (no offense to you other Midwesterners), I am not often considered for jobs in NY or DC. There are just too many local interpreters to justify flying someone in. However, as the acceptance of remote interpreting as a viable solution for international conferences increases, there will be more opportunities for country bumpkins like me. Another comment I heard from those who have used these platforms is that you can focus more on your output when you are not in the room with the delegates. This is particularly true in smaller meetings. I can’t tell you how often my mind has wandered to ‘Why does that one guy keep looking back at me? Did I say something weird? Can he not hear me? Is there something on my face?’ and missed a few seconds of meaningful dialogue. But when you are in a room with only audio and video, you can put your mind solely on your performance and not worry about the audience reactions. There is another side to this coin that we will look at in the next section. Lastly, some users feel that they have lower stress from being in a familiar environment that they can control. (Refer back to interpreting in pajamas.) All joking aside, there is something to be said for getting to see your family after the conference and go to sleep in your own bed. What do interpreters dislike about working remote? The biggest concern from all users I spoke with was technical difficulties. Sometimes, despite all the claims these platforms make, the sound cuts out, the video goes wonky, or the participants can’t hear you and you have no idea why. Without a technician on-site (in your house), it falls to you to try and resolve these issues by chatting with the platform’s technician while your partner carries on for another 30+ minutes as you try not to let the audience know you are totally freaking out. And whose fault is that anyway? If there is a sudden thunderstorm and you lose power, do you still get paid? These concerns alone will keep many seasoned interpreters away from remote platforms. The environment is simply too uncontrollable for them to feel comfortable. Speaking of an uncontrollable environment, we all know the dangers of working at home when the world is watching. Interpreting takes an extreme amount of focus which many of us cannot maintain if we have a dog scratching on the door, let alone a toddler bursting in. Next, I mentioned above that there is a flipside to not seeing the delegates. Without being able to see the audience, the interpreter lacks critical feedback which helps you gage your performance. Sometimes you can tell that your register is off or you need to adjust your mic volume by looking at the participants’ faces. Other times, they give you key insights as to whether the speaker is hitting home with an emotional message. All these are lost when you only see a video screen. As conference interpreters, most of us work on half-day or full-day rates. However, the long-standing medical and court interpreting platforms tend to pay by the hour or even minute. These rates are often lower because of the limited preparation due to the unpredictable nature of call-in interpreting and the gap between community and conference rates. As remote interpreting invades the conference world, we must be careful not to devalue our services just because we are not in the conference venue anymore. We are still providing the same high-level interpreting with all the preparation we would do for an in-person conference. It is not cheaper just because you didn’t fly me around the world. Well, my con section looks a lot longer than my pro section. Don’t let that get you down. The technology is really still in its infancy. It will only get better as it advances. Also, we are a long way away from this being the norm for our industry. However, we must face that it is coming and react appropriately. Whether that means, setting a higher rate for remote because you will have to tech support yourself, choosing to never take a remote assignment, or looking into remote booths in your area so that you can offer that as an alternative when someone asks you to work remote. The thought I want to leave you with is this: have a plan for dealing with remote interpreting requests. They are only going to get more common.